Aclima deploys environmental sensor technology, cloud computing, and machine learning to map indoor and localized outdoor air quality. The availability of this data presents opportunities for us to understand and improve, buildings, cities and industry at a smaller cost of the traditional methods. According to a World Health Organization 2016 study, air pollution causes 6.5 million early deaths each year, double the number of people lost to AIDS, tuberculosis, and malaria combined. Unfortunately, air pollution’s most deadly impact is on children. One study conducted by PLOS Medicine found that children exposed to traffic related air pollutants have impaired cognitive development. According to Unicef, It is estimated that 300 million children live in areas with extreme air pollution. American states are required to monitor and control levels of air pollution under the Clean Air Act and the EPA uses monitoring stations across the country to ensure that states are in compliance. Although there are many of these monitoring stations, it is difficult for people to get a sense of their local air quality in their immediate surroundings. It is even more difficult for people to obtain localized carbon emissions data and this is where Aclima steps in. Aclima, a San Francisco based company, designs and deploys sensor networks that extend the senses and bridge the gap between ourselves and the natural world to solve this issue. Environmental sensors are used to measure and understand air quality in real time. Their network of internet connected sensors generates billions of data points across a range of environmental factors and the goal is to make this data easily accessible for anyone who may need it. A video by Aclima, explaining their technologies. In 2011, Aclima partnered with Google to better understand indoor air quality and produce one of the world’s largest indoor environment datasets. This active network spans 21 Google offices around the world and processes 500 million data points daily regarding indoor air quality. In 2014, Aclima took this concept further and partnered with Google Earth Outreach to map outdoor air quality across California cities. 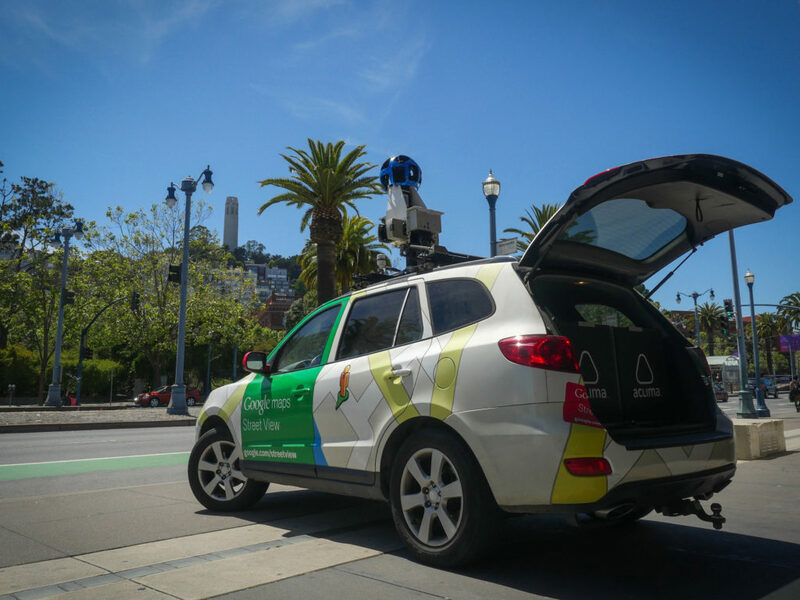 Their mobile sensor technology in Google Street View cars is used to map air pollution across entire cities. Once the data is collected, the air quality data is processed, analyzed and aggregated by Aclima’s data platform. This information will be made available on Google Earth Engine (Google Maps’s geospatial analysis platform). The public will then have access to this data to enable individuals and communities to understand and prevent further air pollution. This image depicts one of Google Street View’s cars with Aclima sensor technology. The most recent project news comes from Oakland, California, where children younger than five years old are hospitalized for asthma twice as often as any other population in Alameda county. West Oakland is the fifth busiest port in the country with industrial and Superfund sites plaguing the area. Two street view cars covered 14,000 miles while collecting millions of data points about pollutants such as nitric oxide, black carbon and nitrogen dioxide.The study was conducted from May 2015 until May 2016 and found that urban air pollution is extremely variable from block to block. This data set is one of the largest of its kind of single city streets and will help cities adapt to and mitigate air pollution. So far, Aclima has driven more than 80,000 miles in California and they are planning to share data from driving in Los Angeles, San Francisco and the Central Valley. A video by Aclima explaining the mapping project in Oakland. The first part of the GIF is showing one pollutant NO2 — the height of the trace increases and the color changes. Yellow indicates higher NO2 concentrations. When we switch views (still in NO2), the GIF shows the time lapse and number of miles accumulated over the study timeline. This emphasizes the sheer magnitude of the number of drives and how it first fills in and then continues as we repeat drives of individual streets as outlined in the paper. “We have a shared responsibility for our planet. Now more than ever, cities are on the front lines of fighting climate change and air pollution. We need better, more hyperlocal measurements. This type of data can help us understand how the local urban landscape contributes to climate change, and how trees and vegetation can protect us from pollution,” states Melissa Lunden, Aclima’s Chief Scientist. Aclima recently partnered with the EPA to advance small scale sensors to get a better sense of air pollution on a local scale. Their findings will help mitigate climate change and air pollution. To learn more about Aclima, visit their website, Facebook and Twitter.